Lily Bart, ornament of 1900s New York society, is refined, cynical, and must get married to ensure she can maintain the lifestyle to which she is accustomed. However, her beauty and thoughtless conquests have made many an enemy, and this novel watches the inevitable train wreck of that societal dream (albeit in her private carriage only). Astute, alert, analytical; a fine piece of writing with a resolutely hollow outcome. Moral of the story: even being able to trim your own hats is not enough to fend off the slings and arrows of misfortune when Society hates your gorgeous guts. Who I’d recommend it to: Those who need some beautiful bleakness – masochists? 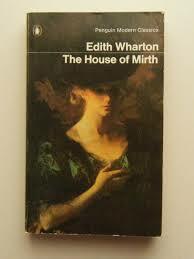 ***SPOILER ALERT TO COMMENTERS*** This is my absolute favourite Wharton … apparently it was first published as a serialised work, and after the last chapter one woman telegraphed her friend “Lily Bart is dead”. I love Wharton’s analysis of society and women’s position, her recognition of the dire situation so many women found themselves in. Unfortunately Seldon wasn’t rich like Mr Darcy! It’s easy for us to say that she “should have” done this or married that, but her upbringing pushed her in other directions. Now, if you haven’t read The custom of the country, do. After Lily Bart you must get to know Undine Spragg (if only for the name!). As you can probably tell, I love Wharton and have read 6 or 7 of her novels, and some short stories. Trouble was that in the end she couldn’t even trim hats successfully in the real world. Doomed, she was. Not good enough and not bad enough to survive. But I find this book strangely troubling. Despite the specificity of the times and social scene it all rings horribly true to me – you are judged by what you appear to be rather than what you are In the end the two can’t be meaningfully separated anyway – what you appear to be is what you are. And if the rules of the game are arbitrary and unfairly slanted, well, that’s just way it is. Oh yes, good point Anna. Her main point was to do with suffocating society, which impacted big time on women but it didn’t necessarily do men a lot of favours. Hide-bound rules rarely do provide for natural, humane behaviour. I enjoy Wharton more than Rhys which may be because I’ve read a lot more of her, but I think she describes the social milieu and its impact wonderfully.